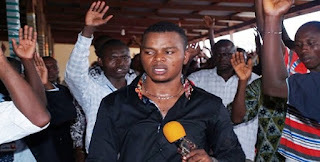 several lashes and mockery from some Ghanaians of whom some are from the same call duty, the leader and founder of the International God's Way Church, Bishop Daniel Obinim finds it difficult to contain what he calls insults and condemnations from his critics and now calls for a spiritual battle with anyone who is ready to challenge him. According to the powerful man of God in an audio which he wants all people over the world to have access to, he is daring anyone who says he is not from God to come face to face with him. "I am serious as I am speaking. I am throwing a challenge for everyone all over the world, whether you are a fetish priest, mallam, pastor, and you think that I Bishop Daniel Obinim is not from God and that I am working with black powers, meet me anywhere you want us to meet. When you are coming too, have it in mind that you are coming to finish me for the whole world to know that I am not from God. So whatever you think you can do to me, do it when you come. Whether you will pray or chant, for that you know what you can do. Whatever you can do for the world to know that I am not from God, do it. If someone sees himself as a man like me, he should face me. I am very wild. It's about time we let the world know that my father Jesus Christ has given me powers. Why are you giving all glories to Satanic? We don't give glory to Jesus Christ and God. The one who died and took our sins away. Any good thing is implicated to Satan. Why? It's about time we stop those nonsense and give glory to God. I want a man like me to face me. And if you finish with your everything and nothing happens to me, hey, I will prove to you that I am an angel of God. I will lift my hand and call on God for everybody to know that indeed God has called me. And you will see what will happen there. We will pick your corpse. You will see your death. I want all media houses to carry up this story. I am very wild. " The Hallelujah man of God has received many insults and distasteful comments from a section of Ghanaians of whom some are men of God after he made a comment that he is able to metamorphose into any creature to visit people in their dreams and everywhere. Recent among them is coming from the Apostle General of the Royal House of Chapel, Rev Sam Korankye Ankra who is saying that Obinim is a magician and not from God.